Many Lent traditions help us reflect on Christ’s sacrifice and get our heart ready for the wonder of Easter. Some people give up things like chocolate, sweets or another favorite food. Some people add things like writing an encouraging note to someone each day of Lent. These traditions help us purposefully notice God’s presence and His gift of forgiveness. This Easter season we invite you to add to your Lenten practice with a gift of comfort and hope for families who are living in a season of lament. Maybe you’re going to give up your coffee or candy? Maybe you would like to be more intentional in your generosity during Lent and beyond? 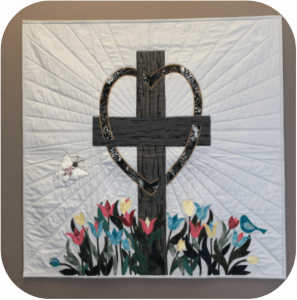 Just $25 from 300 families would raise $7,500 to serve the grieving and needy through quilting. What a wonderful way to turn the sacrifices of Lent into a praise offering to God! Miraculous things happen when God’s people invest in His Kingdom. 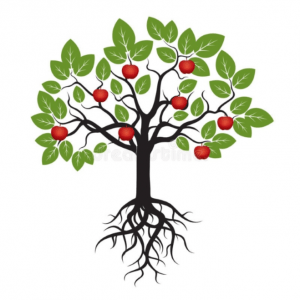 Sewers invest their time, using their skills to serve the grieving; families invest their money by donating for volunteer hours put into making their memory quilt; the fruit of His kingdom buds as children in Kibera benefit from donations. We can only imagine what more God will do! 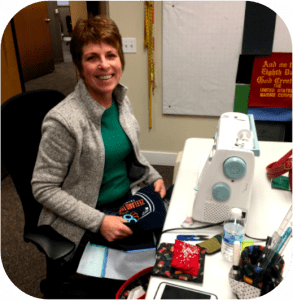 Volunteer quilters like Katie spend one to two days per week piecing and praying for grieving families. Volunteers form the branches of Living Threads, bringing comfort to those who are in desperate need of comfort. Finished quilts tell the stories of the person they honor. This quilt story tells of a deep faith in Christ and a simple love of tulips and her Dutch heritage. In gratitude, a donation is made to the ministry based on the number of hours that volunteers spent making their personalized quilt. Quilt recipient families make donations to Living Threads based on the number of volunteer hours that go into making their memory quilt. 100% of that donation goes to children living in desperate poverty in the Kibera Slum, Nairobi, Kenya. Your gift to Living Threads brings hope to a grieving wife, husband, parent or child which in turn gives life to children in the Kibera Slum of Kenya. You bring comfort and healing to the grieving. 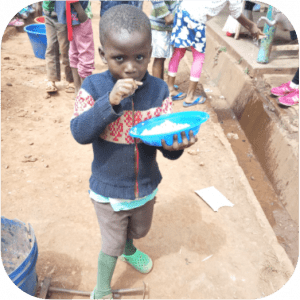 You give the children of Kibera nourishment for their hungry tummies, a safe and loving environment, but, most importantly the opportunity to hear about salvation through Jesus Christ. Thank you for choosing to support the ongoing work of Living Threads. Because of your sacrifical gift more families and children will experience the joy of knowing others care about their pain and are willing to help! Your check payable to Living Threads. We also accept donations of stock through Edward Jones. Please (contact us) if you need further information regarding stock donations. BUDGET………a word that often causes us to cringe but it’s a necessity to be good stewards of the resources God has entrusted to us. Our “Circle of Friends” give monthly to help meet those “budgeted” expenditures that allow Living Threads to exist. Would you consider sacrificially giving $10, $20, $30 or more per month? This could be done through your debit/credit card or bill pay. Your monthly support would be an important investment in God’s Kingdom work to help us serve the grieving, suffering, needy, and poor. To become one of our special “Circle of Friends” please (click here) to print the form to register. Do you ever order from Amazon.com? Did you know that 1/2% of your purchase could go to support Living Threads? Next time you order from Amazon please use the above website and enter Living Threads as your non-profit of choice at checkout. Amazon takes care of the rest! Please use the website below. Shopping With Purpose….Help Living Threads earn $1,000! It’s simple: either drop off or mail your original Family Fare and D&W receipts to help us collect 150,000 points. Spartan will then donate $1,000 to us!